Frances Schandera-Duarte was born in 1975 near Dresden. She studied Fashion Design in Schneeberg / Germany. After creative periods in Kazakhstan and Switzerland, Frances completed a postgraduate course at the College of Fine Arts in Dresden / Germany. She works as a freelance artist and lives with her ​​husband, South African artist Everett Duarte and their daughter in Germany and South Africa. 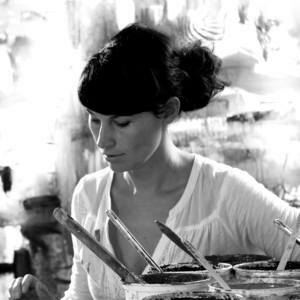 Frances Schandera-Duarte include´s a large palette of eclectic art materials in her paintings. These are fashioned in a way that merge and blend all elements into a unified and compelling whole. She layers oil paint with ink, incorporates glued surgical gauze, mineral sands and various papers to create these meditative paintings. White provides her with an imaginary space, specific visual elements layered into the whiteness appear to ‘glow’ from within the surface. This allows for many different interpretations of the final piece. Without any figurative context, Schandera-Duarte manages to direct the living surfaces of her works with idiosyncratic structures to create dream-like mindscapes. Her work has an alluring quality in that it pulls the viewer closer to the painting in an attempt to gain as much information from the surface as possible. Curiosity often results in the need to gently touch the paintings surface.